Baguio Golf Courses | Go Baguio! Do I know anything about playing golf in Baguio City? As I probably mentioned elsewhere on this site, from 1991 to 1997 we had the opportunity to run a restaurant in Camp John Hay upon the US Bases turnover to the Philippines. Well, that restaurant was called Halfway House and it sat in a beautiful location between Hole No. 9 and Hole No. 10 of the Camp John Hay golf course. The funny thing is that I never took up the sport (looking back, I really should have), probably because we were so busy serving quick meals to the golfers who used to pass our way every sunny day. Our most esteemed guest was President Fidel V. Ramos, an avid golfer who made it a point to play at least one round while on official visits to the Summer Capital of the Philippines. Located 5,000 ft above sea level, Baguio City has two of the coolest golf courses in the Philippines. 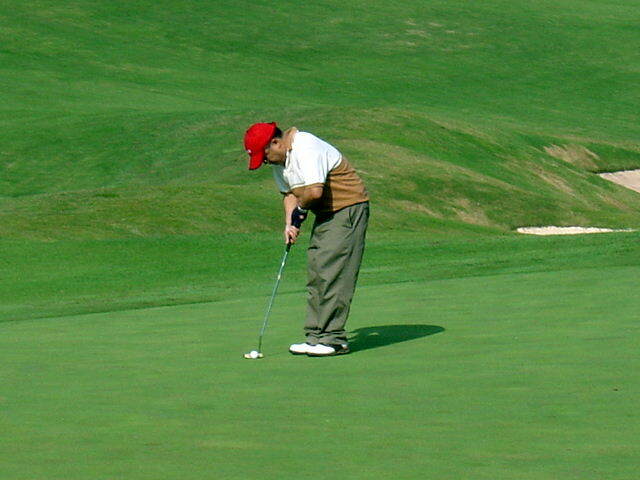 The chilly weather, bright sunlight and rolling hills make the game of golf both very pleasant and very challenging. This 18-hole par 61 and 4,038-yards course is designed by Luis Golem Silverio and sits on land occupied by the Baguio Country Club as well as a portion of the Botanical Garden across South Drive and Nanoy Ilusorio Drive (formerly Park Drive). This is the oldest golf course in the city. This golf course is composed of seven par 4s and eleven par 3s, with tight and narrow fairways that lined with pine trees and elevated greens. It also features three lagoons, each with a depth of 8.5 ft that serve both as water hazards for the players and an irrigation supply for the golf course. Type of grasses found there are of the Korean, Carabao and Bermuda grass varieties. The first two types are usually planted on tee boxes while Bermuda grass is planted on greens. Camp John Hay golf course reopened in the summer of 1999, this time a world-class golfing facility said to be only golf course in the Philippines with bentgrass greens. The original 18-hole par-67 layout was upgraded by Jack Niclaus's Golden Bear International Design to a challenging par-69 course (5001 yards from the tip) that conforms to the environmental standards set by international golfing agencies. To minimize the use of water, new kinds of turf grass have been introduced: Bentgrass for the greens and for the fairways a type of grass from the Bermuda grass family known as Tifway 419. Camp John Hay also has a driving range and a full golf cart path and co-hosts the annual Fil-Am Golf Tournament. It is said to be the superior golf course in the city, and certainly one of the most popular in the Philippines. Camp John Hay and Baguio Country Club co-host the Fil-Am Invitational tournament which is the longest running amateur golf event in the Philippines, participated in by golf enthusiasts coming from all over the world. Both are also private membership clubs, although arrangements can be made for non-members to play for a limited period during their visit to the City of Pines. So while my experience was limited to a few buckets of golf balls at the driving range, I did get to host tournaments and listen to all the regular golfers' stories for years and I certainly can tell you that playing golf in Baguio City is one very popular recreational sports activity for both visitors and residents.